Those tomatoes are amazing! No wonder critters passing by can’t help but take a bite. If I was your neighbor, I myself might turn out to be the culprit…though I can see it would be much smarter for me to just wait until the tart is out of the oven. 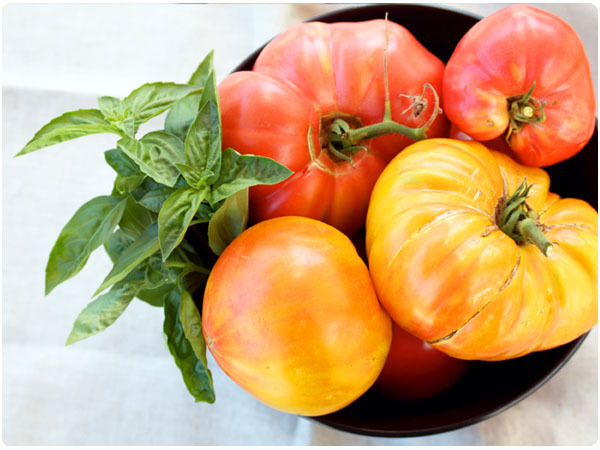 I’m not growing tomatoes this year, but thanks for the tips for perhaps when one day I do! Looks delicious! 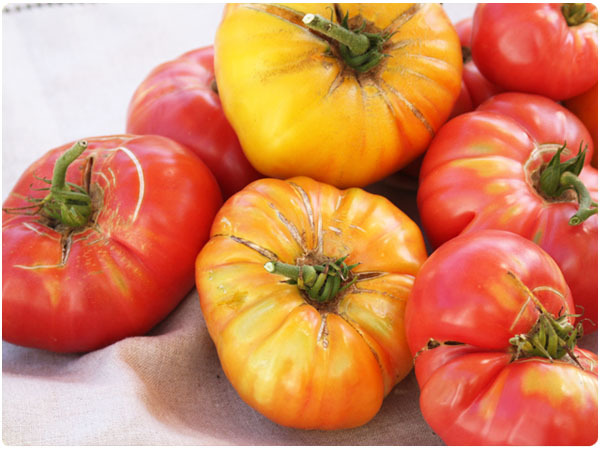 Glad to hear the critters have stayed away long enough for you to harvest your heirloom tomatoes. Katie, are you taking photography classes? Your pictures have been turning out really good. We’re having the same issue with the tomatoes. I think I’m going to put some fishing net or something similar over them at night (that seems to be when the illicit behavior occurs). That way light can still get through and they won’t be weighed down when I (most likely) forget to remove the net in the morning. @sara – thanks! no photography classes but I’d love to take one…just better lighting outdoors! I just took the tart out of the oven and had a piece. Delicious!!! I used a round tart pan and Pillsbury rolled pastry crust partly because I’m lazy and it’s delicious!!! I sprinkled a little parmesean cheese on top and salted and peppered the tomatoes. Fabulous. Thanks so much for the great recipe. The squirrels are horrible and eat every tomatoe that is remotely ready! I put up a net and a fence and it doesnt’ stop them. So I’ve picked them early!! Next year maybe I can come up with chicken wire fencing!! They sure are persistant. But i don’t blame them cause the Heirlooms are fabulous!! I have a photo but didn’t know where to post it!! @Connie – so glad you liked it and I like the idea of the parm on top. Hope you win the battle against your squirrels! 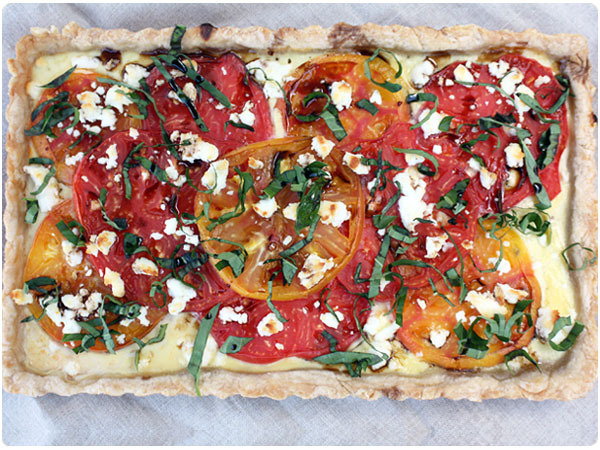 Can hardly wait to make this beautiful tart! The tomatoes look so beautiful! Happy to find your through Summer Fest! Pingback: Tomato, Basil and Olive Bruschetta | ~Dixie Chik Cooks~ Tomato, Basil and Olive Bruschetta | A Southern Belle who thinks about what's for dinner while eating lunch. your tart looks beautiful! i love summerfest and posted my recipe for chicken provençal with heirloom tomatoes. Wonderful easy dinner meal. 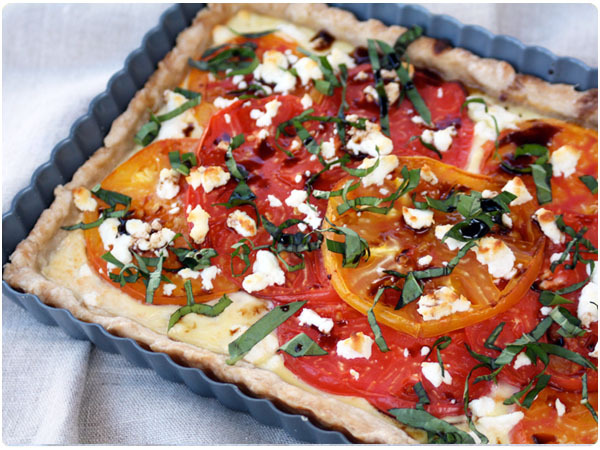 Love making savory tomato tarts for lazy summer nights. We have a big avocado tree in our yard and squirrels steal the fruit all the time. I wouldn’t mind if they ate the whole piece but they take a nibble and toss it away. The tree is so large that there really is not any way to cover it or keep them away … we just have to deal with it. Boo. @Chez Us – how sad! An avocado tree sounds awesome since they are sooo pricey at the store. Hope you get to snag a few before the squirrels do! Thanks a lot! Absolutely delicious. We used prefab puff pastry, feta instead of mozzarella, and baked the whole thing for a few minutes to warm it through. Just an exceptional dish.